The Australian mining company Lonrho Mining Ltd. has discovered a gem-quality 131.5 carat diamond alongside a 38.3 carat diamond from its Lulo Diamond Concession in the African country of Angola. 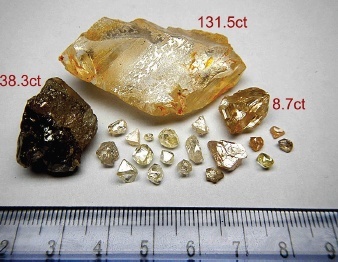 The 38.3 carat stone was also from the same alluvial bulk sample where the former was found, and is the third biggest diamond recovered from the concession to date. This diamond is the biggest one discovered by the Perth-based company since its partnership with Endiama, the national diamond company of Angola. The discovery of the 131.5 carat diamond is significant, as based on a report by Bloomberg, because it has outsized one of the former title-bearers of ‘world’s largest diamond’, the Koh-I-Noor. At 105.6 carats, it was also known as the ‘Mountain of Light’ and the ‘King of Jewels’ in the history of precious gems. It is now incorporated in the platinum crown of the late Queen Elizabeth of the British monarchy. It should be noted that the world’s biggest rough gem-quality diamond of record is the Cullinan Diamond at 3,106.75 carats. The Cullinan I, one of the world’s largest polished diamonds at 530.4 carats, also known as ‘The Great Star of Africa’, was cut from it. The gems cut from the Cullinan Diamond, known as Cullinan I and Cullinan II respectively, were incorporated in the Crown Jewels of the United Kingdom. The 545.67 carat Golden Jubilee was the contender that beat the Cullinan I in being the largest polished diamond in 1985. It is currently owned by King Bhumibol Adulyadej, the reigning monarch of Thailand. It was presented to him in honor of his 50th coronation anniversary. The Golden Jubilee is now housed in the Grand Palace in Bangkok. No value estimate has been given for the stone yet, as it is still to be subjected to evaluation by diamond experts. Lonrho is optimistic about the exploration potential of the Lulo Concession as it proceeds to undertake its drilling operations in the African country. According to DeBeers, the world’s leading diamond company, Angola follows behind Botswana, Canada, Russia and South Africa as the world’s largest diamond producer by value. Investors in the Angolan mining industry are starting to have high hopes because of this recent discovery.